I began to pay more attention to the lyrics of the great blues masters. 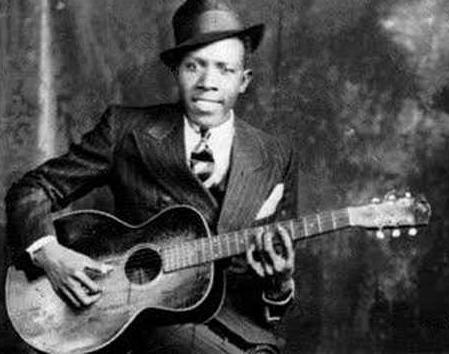 Of these masters, Robert Johnson is recognized by most as the first true blues master. What defines a genre? Is it what they sing about, or is it the style of music? Perhaps a combination of the two? As I was reading the Psalms recently, it dawned on me that the Psalms are similar to the blues. We know that the Psalms are themselves songs, though of a more religious nature than today’s blues songs. But once we begin to dig a bit deeper and employ metaphors and allegories, the link is surprisingly strong between David’s psalms and, say, Robert Johnson’s songs. Although I’m not a Old Testament scholar, there seems to be three or less parties in any given psalm. From what I can deduce from my own readings: God, the psalmist, and a third party. This can be either Israel or Israel’s enemies, depending on the psalm. It is either the psalmist turning to God in supplication, praise, sorrow, asking for mercy, and so on. It can also be God addressing the psalmist and Israel. The third party comes in because the psalmist asks God to deliver him from or destroy his enemies. Many of the Psalms seem to have a sorrowful, melancholic mood to them; the psalmist is often sorrowful because he has been unrighteous toward God. I think the key that links the blues genre with the Psalms is the often-used metaphor of Israel as the Lord’s bride. In many of the Psalms, the Lord often has difficulty with Israel's infidelity. A similar theme also drives most blues songs, the broken love between man and woman. The blues genre in its most authentic expression captures the soul’s deepest pangs: the bluesman emits a deep sigh as he sorrows over the dysfunctional, and often severed, relationship between man and woman. Similarly, the psalmist emits a deep sigh as he turns to God with a contrite heart. You breaks my heart / When you call Mister So-and-So's name. It has been helpful for me to keep the soul of blues music in mind as I read the Psalms. What seems to be the key is the affective response that blues music generates. Nowadays, the accompanying music does not necessarily match the content of the Psalm. Should Blues music be introduced into the liturgy? I don't think so, but there are other venues in which such music would be well received and very edifying.